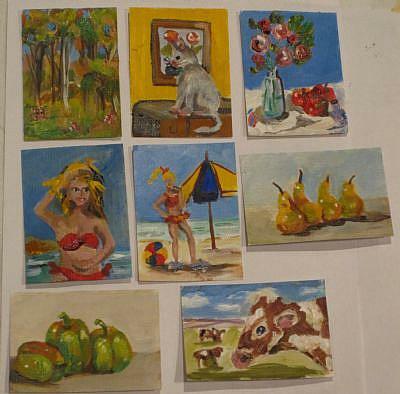 Description of artwork About ACEO Cards: ACEO stands for "Art Cards, Editions and Originals". These cards have one main rule - they are 3.5 inches by 2.5 inches - the size of a trading card. The reason for this is that Art Cards are made to be traded! Art cards are normally available at low prices so that they're available to anyone. Artists from all over the world are creating, and now selling these highly collectable art cards in many different mediums. Watercolor, Oil, Acrylic, Colored Pencil, Pastels, Petrography, Pen and Ink, Sketching, Collage - the sky is the limit. 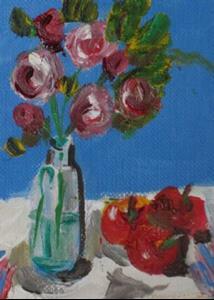 Abstract, Surrealism, Outsider Art, Impressionism, Expressionism -every style you can think of - and then some! Extremely collectable Pocket Art, you can't stop at just one! They can be displayed as artworks - hung in decorative frames either individually or in groups. It is signed and dated on the back. 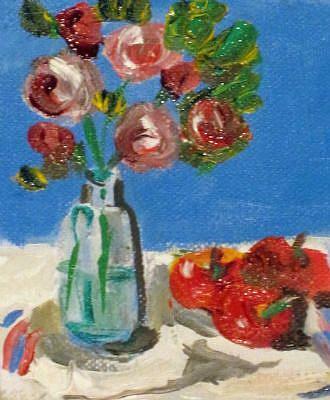 This work will be shipped in a clear acid free bag to protect your investment Title: Rose and Apple Aceo Still life Style: MINIATURE Size: 3.5x2.5 , Colors: blue,red,green Medium: oil Support: canvas paper Shipping: USPS Priority Signature: Always Signed I will be listing new work on a regular basis. If you don't find something on your first visit, please keep coming back. In the top right you will see a link, View Seller's Other Items. Please click this link and all of my paintings in my gallery will come up. Thank you, DELILAH .